When the weather starts to warm up there is nothing I crave more than to go outside! 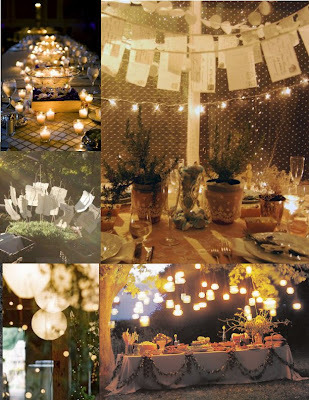 What's even better is an outdoor party with homemade goodies, relaxed conversation and sparkling drinks. I love how beautiful a space can become with hundreds of candles, lanterns, and twinkling lights, not to mention the amazing colors that are created with those types of lighting! On that note, I thought I would put together a board focused just on that type of celebration. Enjoy! *Throughout the week I will post pictures of weddings that remind me of the same feeling and could easily mesh with this kind of party!